Cabernet Sauvignon and lamb are a pairing par excellence, as if they had been born for each other. The intensely flavored lamb ribs join the aromas of the wine, where the black fruit and the spices stand out. The structure and volume of the wine can sweep the fat content of the dish, whereas the tannins and the alcohol play a fundamental role with the sweetness of the onion, the earthiness of the mushrooms and the slight bitterness of the eggplant. The final fresh touch of the wine invites you to keep eating. Lamb ribs (French rack) – 1 kg. Paris mushrooms – 200 g.
Portobello mushrooms – 200 g.
Wash the onions and cook them with their skin in the oven at medium heat for 20 minutes. Remove from the oven and let cool. With the help of a small knife, cut a ‘lid’ on top of the onions and hollow them out. Season the inside with salt, pepper and a dash of olive oil. Chop the heart of the onions and cook them in a frying pan along with sliced mushrooms and a dash of olive oil. Add the thyme, salt and pepper. Cook at low heat for 15 minutes, and finish with a few tablespoons of cream, cooking for 5 more minutes to allow the cream to reduce. Adjust the salt and pepper seasoning. Stuff the hollowed-out onions and sprinkle them with bread crumbs. Gratinate in the oven. Cut the eggplants in half lengthwise and score the flesh in a crisscross pattern. Sprinkle them with coarse salt and, after 1 hour, rinse them removing the excess of salt and juice. Cook them with a dash of oil and covered with aluminum foil in the oven at medium heat, until the flesh pulls away easily from the skin. Mash in the food processor and season with salt and pepper. Cut the rack of ribs into pairs and, with the help of a small knife, remove the excess fat from the bones. Add salt and pepper, and cook on the grill for 4-5 minutes on each side. The ribs should be juicy inside. 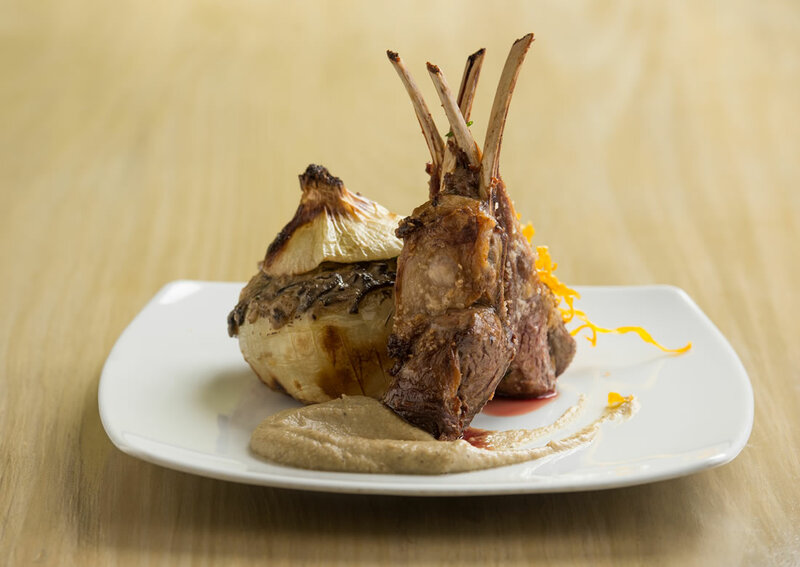 Serve the lamb ribs with the hot gratinated onions and a tablespoon of the baked eggplant purée.